The best soaking tubs are the ones that are the most comfortable to spend a bit of time in. Whether you’re soaking for medical purposes or you just like spending time relaxing in the tub, there are a few common criteria you want for a soaking tub. Without further ado, let’s discuss the best soaking tubs for your money. Reinforced fiberglass is a great material to build a tub out of, and this Rachel tub is made of that exact stuff. It’s a gorgeous, sleek white with a polished finish that makes it a great central point of any bathroom. Elegant and durable all at once, this is a great soaking tub. The durability on display here is great, as you know the tub will last you for years. It’s free-standing, so it’s got a unique and old-school look. American Standard is a common name when it comes to tubs. Soaking tubs are also in their repertoire! The form-fitted back rest in this tub is top-notch and reason enough to consider it. When it comes to soaking tubs, one of the most important criteria is that the tub be comfortable to sit in for long periods. In the case of this American Standard tub it’s hard to overstate how much more comfortable the tub is with the form-fitted back. Whether you’re looking to soak and relax or just take a quick dip, this tub is a great value for you. Kohler is a respected name when it comes to home appliances, and tubs are no exception. This Kohler tub has a unique recessed design that makes it very striking and comfortable. The tub sports armrests as well as an overflow basin. With its depth, this tub isn’t really suited to children. 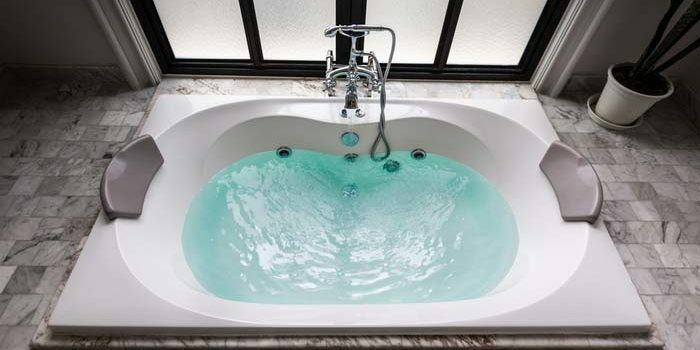 It’s a soaking tub made specifically for adults, thanks to its dimensions. Just keep that in mind when considering having it installed. Speaking of installation, it does require a bit of skill (or hiring someone with said skill) to install.